Free admission, prior registration is required until October 13, 4:00 pm. 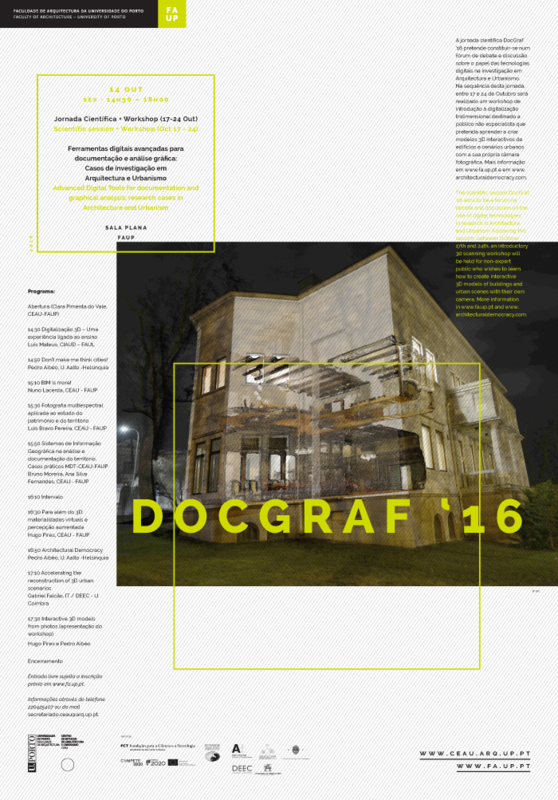 The scientific session DocGraf '16 aims to be a forum for debate and discussion on the role of digital technologies in research in Architecture and Urbanism. In this first session experts from various fields of knowledge share experiences where the use of these new tools, specifically from the area of geomatics and computer graphics, proved to be a critical success factor in the projects in which have been integrated. The session will also feature the presentation of the project Architectural Democracy that focuses on the relationship between architecture, technology and policy and its implications in the context of citizenship, architectural practice and urban policies. The line of research focuses on ways to use technology to transform buildings in "open-source" interfaces to improve citizens' understanding of the everyday built environment and, therefore, the quality of architecture and citizenship. Following this session, between October 17th and 24th, an introductory 3d scanning workshop will be held for non-expert public who wishes to learn how to create interactive 3D models of buildings and urban scenes with their own camera. More information in www.faup.pt and www.architecturaldemocracy.com.